I've been trying to vary the colors of the leaves in my latest jute project. Beginning with two strands of green, I changed to one strand each of the two colors. 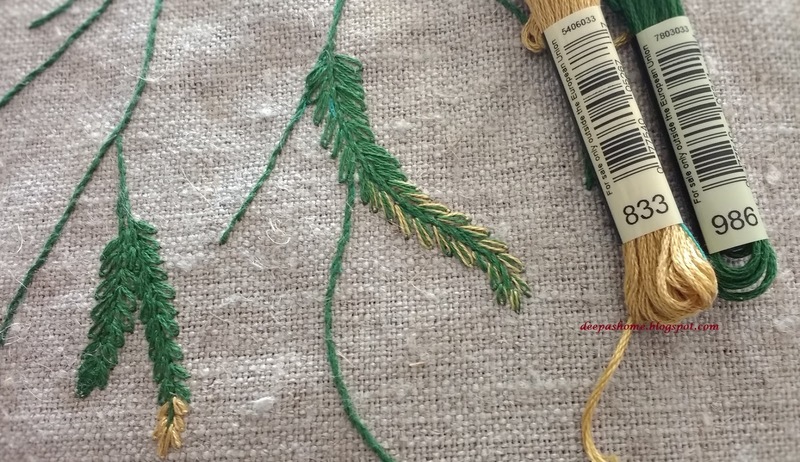 For the smaller leaf, I stitched only the tip with the golden olive shade. Which colors have you used for double colored leaves - bright yellow? browns? I will be back after stitching up a few more of these.. I haven't stitched leaves much but I like the effect you got mixing the colors. I always look forward to seeing your needlework. Using two colours makes the leaves look so much more realistic. I like this! I don't think I've ever embroidered on jute before! Your leaves look really pretty with the two colours. Such an inspiring idea!